Sunday morning, another family separated from us to visit their daughter’s orphanage and have Alice (Sporty Spice) to accompany them. Katie and Claire may see their best buddies Josie and Emelie morning of the day we fly home if we are lucky. The rest of us were assigned Rebecca (Ginger Spice, with dark auburn hair) for a few hours to take us to the airport for the flight in Guilin. Another efficient handoff. We were met by Andy (Bieber Spice?) in Guilin. His English isn’t as good as the other guides (who were excellent), but he is knowlegeable about his home town and is personable like all the others. We had a light rice noodle lunch when we arrived. Although I swear I wasn’t hungry after the lunch on the airplace, I ate a big delicious bowl of noodles with seasonings. The population of the city of Guilin is small by Chinese standards at about 600,000. As Andy as told us a few times, it had a face lift after Bill Clinton visited. The president had apparently made an off-hand comment indicating it had the potential to be beautiful city, so the Chinese government shoveled money into re-development. Well it is beautiful now. Like other cities, the larger streets have a separate outside lanes for bikes and scooters, but here they are tree-lined. There are four lakes in the city fed by two different rivers with the water clear enough, and the city hot enough, that many people swim off the banks in the morning and evening. In the morning after sending their grandchildren off to school, the grandparents gather at the park along the banks for tai chi. The city is known for the numerous small limestone hills that rise sharply from the city plateau. A picture of them is on the 20 Yuan note if you want to google for it. Apparently the hills were the inspiration for the landscape of the Avatar movie. Tour buses abound here in what has become a tourist city. 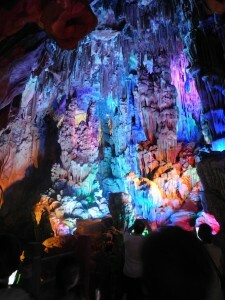 In the afternoon we visited the Reed Flute Cave. Chris, because it was her natural habitat, stayed in the gift shop while the rest of us traipsed up and down the stairs in the cave. Colored lights highlighted formations that were said to resemble lions or monkeys. And no cave experiece would be complete without a tacky laser light show with music near the exit. The air conditioning on the bus died after we were dropped off and it was delayed quite awhile before it could pick us up. Yes, it is a first world problem, but China is really hot this time of year and we were all soaked in sweat by the time we got to the hotel. A planned trip to the art museum with a calligraphy was canceled because we were running late. The hotel room in Guilin has picture window between the bathtub and the main sleeping section of the room. It is an odd arrangement for us non-exhibitionist types, but thankfully the window has a waterproof Roman shade that can be drawn. It beats the previous night’s hotel where there was a full length mirror running the length of bathtub. Showering in that hotel didn’t help my ego either. The group had a late, pleasant dinner and I had yet another type of Chinese beer, Liquan, this time. I’m not a beer aficionado, but it beats coating my teeth with sugar from either Sprite or Coke. Diet drinks do not exist at restaurants and you have to beg for bottle water. The restaurant was on the second floor above a market. Its restrooms were on the second floor as well, except through an external walkway to another building. The typical arrangement we’ve found is a single toilet roll hanging outside the bathrooms. You have to remember to pre-measure the amount of paper you expect to need before heading in. It is always a surprise whether it will be a Western commode or the traditional Chinese hole in the floor to squat over. Let’s just say sometimes is good to be a male.